Louis Roederer Champagner: Champagne L. Roederer Premier Brut, seperate in gift box Champagne L. Roederer Premier Brut, seperate in gift box: �From the outset, Brut Premier affi rms its personality and seduction: the texture is full and generous and, in a fairly unexpected way, integrates characteristics of maturity associated with fruitier and more refreshing notes. 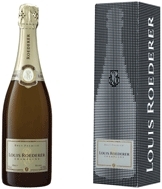 The Roederer Champagne has a fresh festive finesse…“In the mouth, the wine has structure, richness and length. It is a full, complex wine that is both modern and powerful, whilst remaining a great classic» https://www.weinbaule.de/sparkling-champagne-roederer-premier-brut-seperate-gift-box-p-1189.html?language=en&osCsid=f19dc6f3871a03d1e629c9eaf6d6f38a"> Wine 37.98 3114080016053 WeinBaule.de | The Home of Wine Louis Roederer Champagner New In stock!